Our first stop was Bethlehem, Connecticut to see a dear friend from our college days. We stayed at a very nice Harvest Hosts location, March Farm, but we were in such a hurry to meet up with Paul we failed to get a photo. Their spiced peaches were yummy! The next day we drove to Guilford, CT to check out that area for a bit. We stayed at a Harvest Hosts location called Bishop’s Orchards. This was actually their retail side of their operation, located directly on US-1. Still, it was plenty quiet for us. They had a store that was fabulous, with everything from specialty meats and cheeses to wine, produce, and ice cream. They also had llamas, goats, pigs, and other assorted farm animals. It rained like crazy the full day we were there, so we didn’t do much exploring. We did go out to dinner, just to get out of the rig for a bit. There was a wedding going on at their venue next door that wrapped up early in the evening. We felt bad for them, as it just poured the entire day. On Sunday, May 20, we headed for Rhode Island. We quickly passed through this tiny state on I-95 back in 2007, so we didn’t know much about it. This time, we made plans to go to dinner with our friends Jerry and Linda from our park in Florida, as this area is their home. Our campsite at Fisherman’s Memorial State Park was huge! We quickly got everything set up before our friends came by to pick us up. We went a few miles east to Galilee to a little seafood joint called Champlin’s. It was delicious! The restaurant overlooked Galilee Salt Pond Harbor, and was just north of Salty Brine State Beach. Jerry explained to us that the little park was named after a local TV and radio personality he remembered as a kid. Salty Brine’s afternoon TV show, Salty’s Shack, ran for more than 50 years. It featured Popeye, Little Rascals and the Three Stooges films and cartoons. In the morning, he would read off the school closings on WPRO-AM. Two towns in western Rhode Island, Foster and Gloucester, typically received more snow than other parts of the state. With his New England accent, Salty would lump them together and shorten them to “No school Fosta Glosta!” He reminded us of our own Michigan weatherman when we were growing up, Sonny Eliot. On May 21 and 22, we explored the area around Narragansett a bit. Coming into town Narragansett Pier, the road goes under this historic building known as The Towers. Once connected to a large resort, this 19th century structure has survived multiple fires, nor’easters, and hurricanes. The Coast Guard House restaurant sits between it and the water. We sat at their bar and enjoyed an afternoon cocktail and the view. While there, we noticed a lighthouse blinking across the bay, so we drove over to check it out. This is Beavervail Point Lighthouse State Park, located at the southern tip of Beavertail State Park. This light station was built way back in 1856. This is actually the third tower to be built here, the first having been constructed in 1749. We spent the afternoon enjoying the sunshine in the adjacent park. We also visited Point Judith Lighthouse. 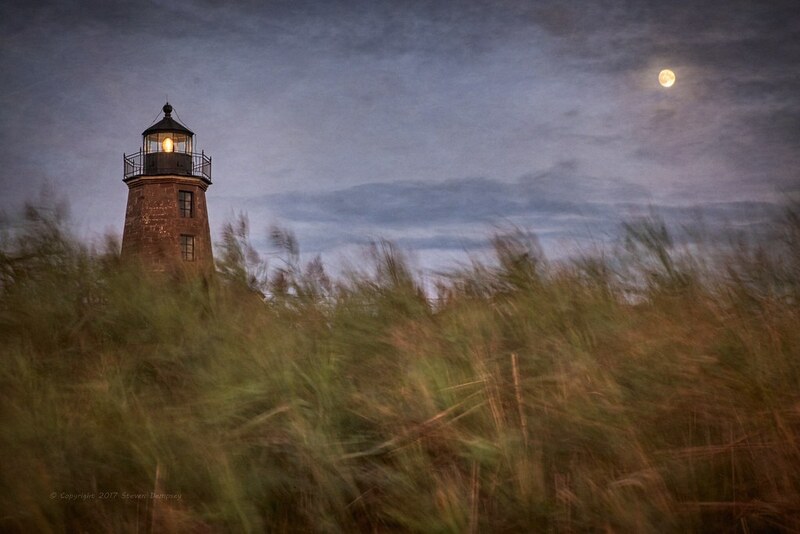 This was the subject of one of my favorite Steven Dempsey photographs, The Wind and the Moon. The first tower was constructed here in 1810, with this one being built in 1857. Its light shines over Point Judith Harbor of Refuge and the Atlantic Ocean. We really enjoyed our time in Connecticut and Rhode Island. These two tiny states are filled with acre upon acre of beauty. With their location being so close to Boston and New York, one would not expect the peace and tranquility we found here. We will definitely be back! Next up, we head further northeast to Cape Cod for a week-long stay. Be sure to stay tuned for that. Until then, safe travels to all! Check out our bloggin’ buddies! Check out our previous cool stuff! © Diana and Jim Belisle and exploRVistas. Unauthorized use and/or duplication of this material without express and written permission from this blog’s author and/or owner is strictly prohibited. Excerpts and links may be used, provided that full and clear credit is given to Diana and Jim Belisle and exploRVistas with appropriate and specific direction to the original content. Check out our easy reference guide! Where shall we go today?